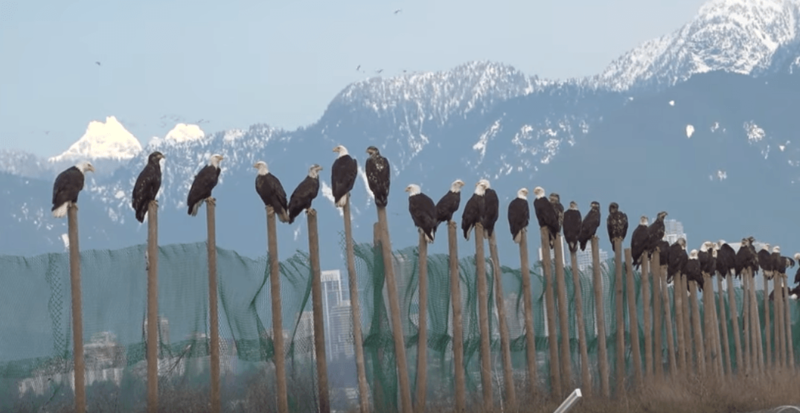 Tens of thousands of bald eagles have flocked to BC’s Fraser Valley — and it’s a majestic sight to behold. A video shot by photographer Christian Sasse shows the beautiful birds sitting on fence posts. During the filming, Sasse was accompanied by local conservationist and biologist, David Hancock. Hancock told Daily Hive that approximately 30,000 eagles have flocked to the Fraser Valley from the north to feast on salmon and other fish. Hancock says that this year’s fish runs are “very poor” but the eagles are expected to stick around until March or April. Hancock did not disclose exactly where in the Fraser Valley the eagles were spotted because he wants to prevent their habitat from being disturbed by crowds of people. “They are best left alone,” he said. But if you do come across this mass of birds Hancock says they don’t usually get bothered. The region is home to the largest congregation of bald eagles in North America, so large in fact it has spawned a festival honouring the flighted birds.